You're on notice, BMW M4. The 2015 Lexus RC F is here to put some fear into you, both with its potent V8 engine and that terrifying spindle grille. Our pals at Road & Track just dropped the first photos and initial details of Lexus' new M-fighting coupe, and unlike Lexi of the past, it comes with some visuals that won't put you to sleep. It's a very butched-up version of the new 2015 Lexus RC, complete with boxed out fender flares, stacked quad exhaust pipes, and a much more aggressive front end. So it's got some show. But can it go? 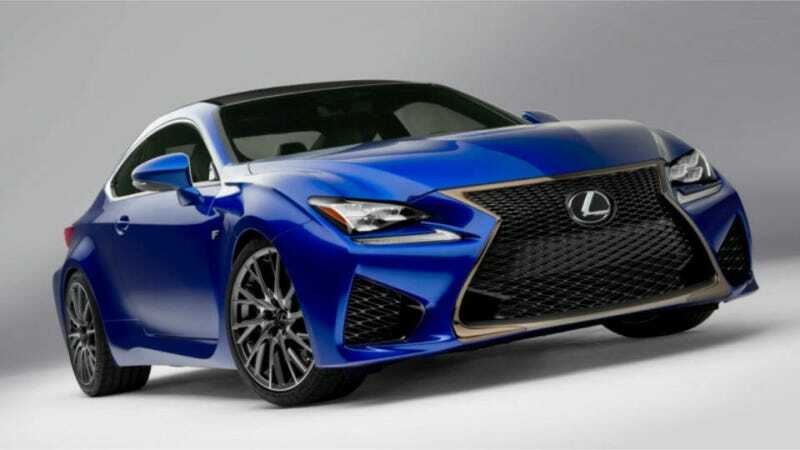 R&T says yes, thanks to a 5.0-liter V8 that's likely a reworked version of the motor in the old Lexus IS-F now retuned to sport about 500 horsepower, although we've also heard 460 horsepower is the real number. Exact specs haven't been released yet. Power will be sent to the rear wheels via the very good 8-speed paddle shift automatic transmission. Expect to see much more of the RC F at the Detroit Auto Show next week. Update: Here's a video preview from AutoGuide.